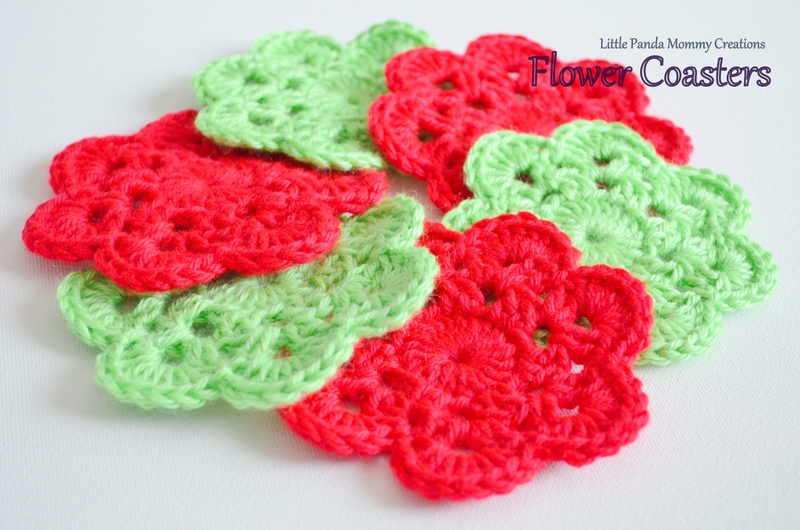 I used Caron – Simple Soft yarn for these coasters, any worsted weight yarn will do just fine, such as Red Heart Soft or Lion Brand Vanna’s Choice. Hook size is 5mm (US size H8). 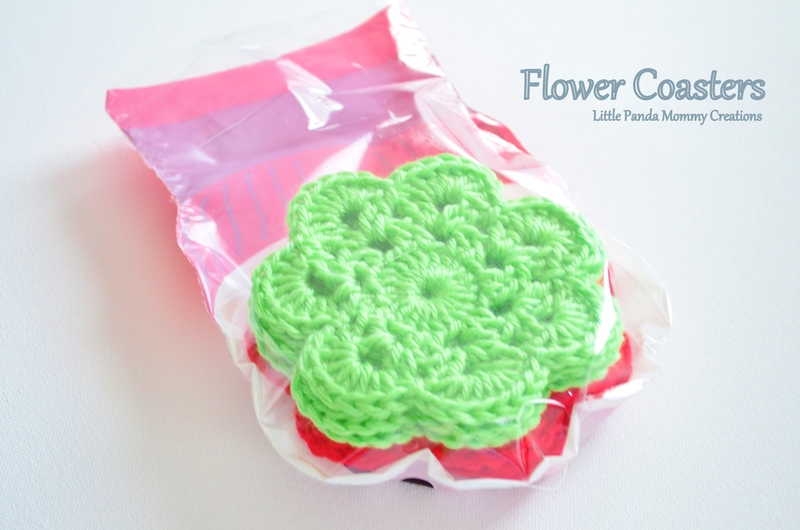 Online class of how to make this flower coaster will be published soon, if you want to join the class, please make sure to subscribe our blog by email (click on the side bar) and like our Facebook page (click here) for updates and more craft ideas. Rnd 1: Magic ring, ch 2, 21 dc into ring, sl st into 1st dc to join. Rnd 2: ch 2, dc into next st, ch 2, sk next st, (dc into the next 2 st, ch 2, sk next st), repeat ( ) to end, sl st into 2nd ch to join. Rnd 3: (sl st into next ch sp, 2 dc into same ch sp, ch 2, 2 dc into same ch sp), repeat ( )to end, sl st into 1st dc to join. Rnd 4: (8 dc into next ch sp, sl st into middle of the next 4 dc), repeat ( ) to end. Cut yarn with a 5 inches tail, weave in loose yarn. Block if desired. You can make them into any colors to match your favorite mugs, your home decor or just simply your favorite colors. 15 minutes and it is done, what better handmade gift to give this holiday season. Put coaster set into a gift bag, tie it with a little tag, give it to teachers, friends, co-workers or the neighbors. They will remember you every time they use them. You have my full permission to sell the handmade product(s) made from this pattern. Please list your item with a live link back to this post and state “Designed by Little Panda Mommy Creations” for credit. We appreciate it. You are welcome to share this blog post or pattern by posting the post link (just copy and paste the URL on the address bar) and please give credit to Little Panda Mommy Creations. However, please do not copy, re-post or sell any written context or pictures in this post, they are all copyrighted. Those are adorable! Love the bright colors and design.